Mom: the Multitasking Marvel of the modern family. As Mother’s Day approaches, plan to give mom a gift she is bound to appreciate: a meal she does not have to cook. From deviled eggs to fruit tartlets, the dishes presented here are ones dads and kids alike can master (and are sure to receive high ratings from Mom’s test kitchen). Almost everyone’s mother has a recipe for this relish tray staple. Place eggs in a large saucepan, cover with cold water and place saucepan over high heat. Bring to a boil. Once the water is boiling, gently roll eggs with a spoon and cook for 1 minute. Remove saucepan from the heat and cover. Let eggs stand for 15 minutes. Drain and place eggs in cold water until cool enough to handle. Peel the eggs. Slice them in half lengthwise. Scoop out the yolks and transfer to a medium mixing bowl; reserve egg-white halves. Mash egg yolks with mayonnaise, mustard, Old Bay seasoning, salt and pepper. Spoon the filling into the egg-white halves using a teaspoon. Dust the tops of the filling with paprika and garnish with parsley, olives and radishes. Makes 10 servings. You can substitute broccoli or fresh peas for the green beans in this dish. Prepare an ice-water bath and set aside. In a large saucepan of boiling, salted water, cook green beans over medium heat for 4 to 6 minutes or just until the green beans are tender. Transfer green beans to ice water bath and set aside. In a nonstick skillet over medium heat, cook bacon until crisp and golden. Transfer cooked bacon to paper towels to drain. Remove all but 1 teaspoon bacon drippings from the skillet. Return beans and bacon to skillet; place skillet over medium-low heat. Season with salt and pepper and cook until beans and bacon are warm. Serve immediately. Makes 6 servings. You might remember your mom or grandmother making chicken and dumplings for a Sunday supper. Place the chicken, stock or broth, cloves and bay leaves in a 4- to 5-quart casserole dish with a tight-fitting lid. Bring to a boil over medium heat. Simmer gently, partially covered, for 45 to 50 minutes. Transfer the cooked chicken halves to a platter. Let stand until cool enough to handle. Strain the cooking liquid into a large glass measuring cup and remove fat from the surface. Return casserole dish to medium heat. Melt butter and add the onion; cook for 5 to 7 minutes. Stir in the garlic, thyme and oregano; cook for 1 minute. Stir in the flour and cook for 1 to 2 minutes, stirring constantly. Add reserved chicken cooking liquid, wine and pepper. Bring to a simmer, stirring constantly, until mixture becomes smooth. Add potatoes, carrots and celery. Simmer over low heat, partially covered, for 25 to 30 minutes, or until the vegetables are tender but firm. Discard chicken skin and bones. Tear the meat into bite-size pieces and add to the vegetables. Stir in the peas and parsley. Cover; bring to a boil over medium heat. Reduce heat to a simmer. In a large mixing bowl, combine flour, baking powder and salt. Using a pastry blender, cut in the butter until the mixture resembles coarse meal. Make a well in the center of the mixture and add the milk and chopped parsley. Stir quickly with a fork until all ingredients are combined. Use two tablespoons to make 12 small dumplings from the batter. Drop dumplings into broth, spacing them evenly in the casserole dish. Cover the casserole and simmer for 18 to 20 minutes. Spoon the chicken and dumplings into soup bowls and serve immediately. Preheat oven to 400 degrees F. Line two baking sheets with parchment paper. Place 6 puff pastry shells on each baking sheet. Lightly brush rims of puff pastry shells with the beaten egg white. Transfer baking sheets to oven and bake puff pastry shells for 10 minutes, rotating pans halfway through baking. Place the frangipane in a resealable plastic bag and cut off one corner of the bag. Remove puff pastry shells from oven and immediately remove tops and soft pastry underneath; discard tops or reserve for another use. Pipe about 1 1/2 tablespoons of frangipane into the middle of each puff pastry shell. Return filled puff pastry shells to the oven and bake for another 10 to 12 minutes, rotating pans halfway through baking. Remove tartlets from baking sheets and transfer to wire racks to cool completely. 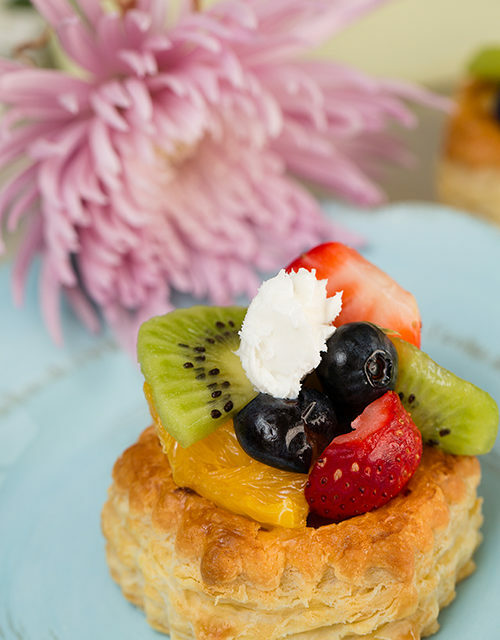 Spoon chopped fruit into the centers of the tartlets, directly on top of the frangipane. Dollop with whipped cream (if desired) before serving. These tartlets are best when served the same day they are prepared. Makes 12 fruit tartlets. Frangipane is a traditional French pastry cream made from butter and ground almonds. In the bowl of an electric mixer fitted with the paddle attachment, cream together the butter and sugar on medium-high speed until light and fluffy, about 3 to 5 minutes. Add the egg, ground almonds, rum extract, almond extract and vanilla extract to the butter mixture, and mix until smooth, about 2 to 4 minutes. Add the flour; continue to mix until just combined, about 1 minute. Refrigerate mixture until ready to use. Makes about 2 cups.